Static cling vinyl is a non-adhesive material suitable for indoor use only. Price includes one ink color; print up to 3 ink colors. Four or more inks available; please call for pricing. 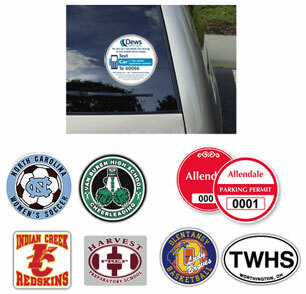 Clear window decals feature Free White Back-up on printed areas for increased readability. Four color process static cling labels available; please call for pricing. We recommend that all static cling labels be removed before cleaning application surface. Provided on roll only unless specified otherwise. Single square-Cut labels shown below are cut down to sigles at no additional charge. If single labels are required on the Rectangle, Oval, Circle or Square dies sizes shown, add a $35(v) cutting charge. Stock Paper: White Static Vinyl, Clear Static Vinyl, White Window Lite and Clear Window Lite.